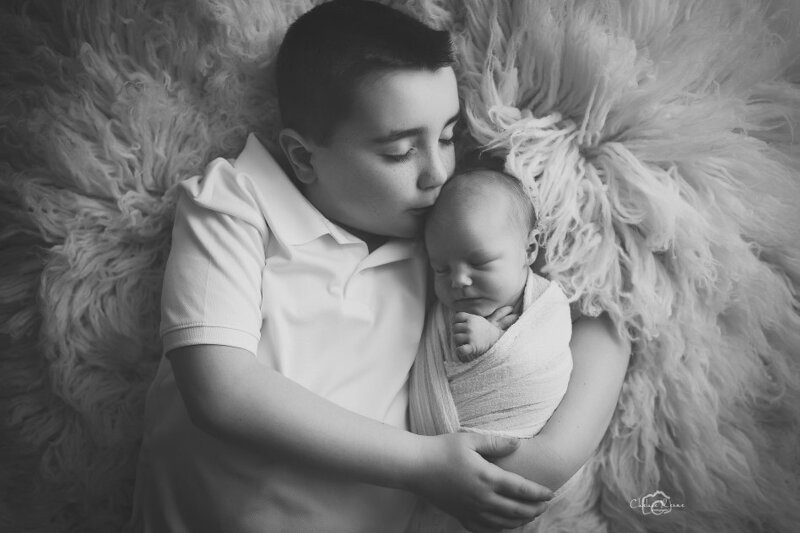 This sweet newborn and her big brother came to visit me for a studio newborn session. I enjoyed setting up beautiful, light, and airy, spring set ups for this family. Newborn sessions include multiple styled set ups, one of my favorites is the new studio bed set up. This comfy bed is located in the studio, its layered with beautiful, neutral textures and makes the perfect whimsical setting for any session. Newborn sessions can include mom, dad, and siblings. I love the precious photos of siblings together. 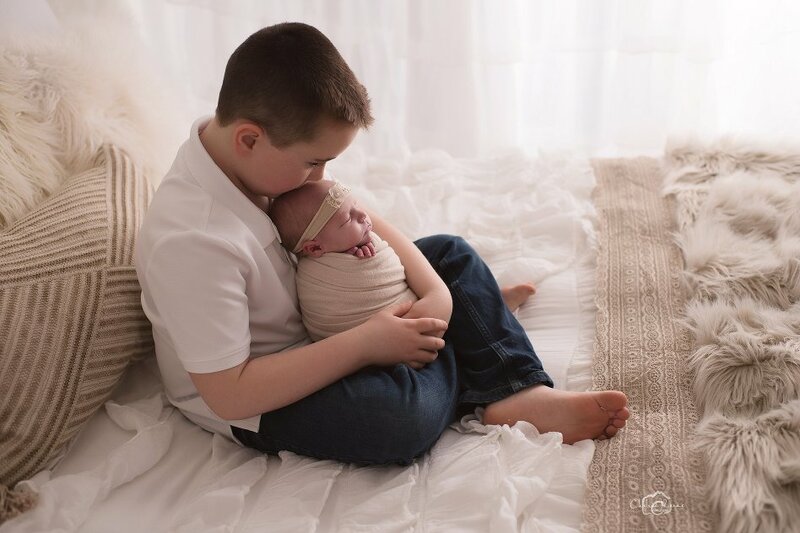 Usually newborn sessions take place within two weeks of your babies birth, capturing the newness of being a big brother or big sister is something you will cherish for a lifetime. Please consider booking your session prior to the arrival of your baby to secure your session date. You can book your session here. Please contact me if you have any questions about your upcoming session. I’m in love with this neutral sage color. This beautiful greenery headband is from The Dainty Meadow. 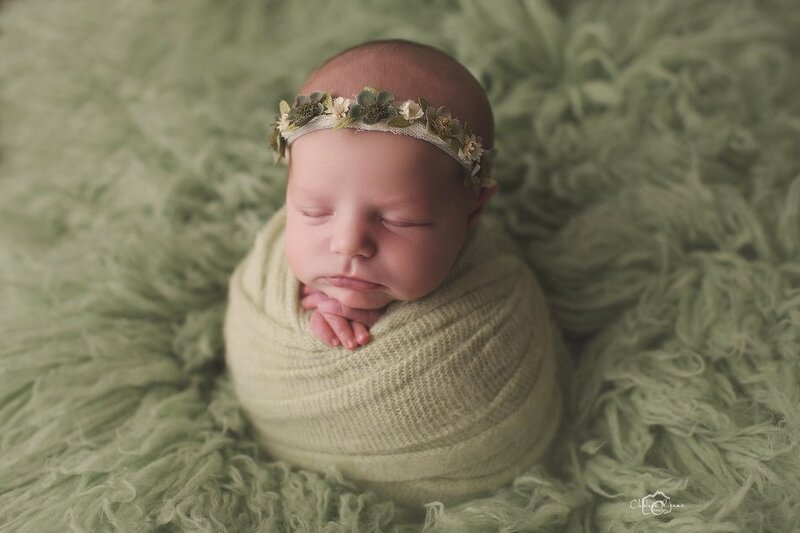 This cozy bamboo basket is one of the many props that is offered here at Chelsie Renae Photography Studio, it’s the perfect size for a sweet newborn to nestle into. This bamboo basket is from The Original Photo Blocks Props. This adorable bunny set up, is a sweet way to show the season that baby girl was born. A beautiful spring baby. This knit bunny hat and chippy plank bed are both by Modest Little Me Boutique.